As Britain emerged form the Second World War in 1945 her motor industry was still geared up to produce the quantities of vehicles, especially commercials, required in wartime. With the urgent need for post-war reconstruction at home and abroad, there was much for such vehicles to do. The liberation of Europe and the Far East meant that these export markets had been opened up again too. The first post-war lorries exhibited very definite pre-war characteristics. and it was to be a good while before British manufacturers began to design their vehicles along new lines. A few brave companies came up with fresh thinking but most of these fell by the wayside. 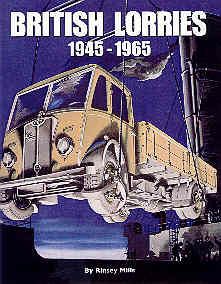 This book traces the path of the British lorry through 20 years via the manufacturers' own sales and publicity material. from the revolutionary - but now forgotten - Jensen to classics like the Bedford TK. During the period covered there were approximately 40 manufacturers of commercial vehicles in the United Kingdom. Several were small or specialised firms with limited production whilst others became absorbed into more successful companies. Albion, for example, was taken over by Leyland during 1951. By 1965 only a few of the even the larger firms remained, and individuality was fast becoming just a memory. More than 400 illustrations from brochures and catalogues, combining often inspired artwork with photographs, give a fascinating social insight as well as providing the true commercial vehicle enthusiast with hard to find technical details and specifications.